This weekend is Ottawa’s Army Race weekend! The popular event brings out thousands of runners to the 5 km and half marathon (21.1 km) distances. Many hours of training are put into the preparation for this run and with the over use of muscles comes pain and dysfunction at with many athletes. Have you ever experienced pain at the knee cap(patella) during and /or after your run that hinders your enjoyment and efficiency? One of the most common conditions we see with training is Patellofemoral Syndrome. Massage Therapy is an excellent modality to help repair and re-align the tracking of your knee cap(patella) so you can be at the top of your race!! Tracking or instability problem with the knee cap (patella) that causes pain in the front of the knee. The patella has a specific gliding path that it takes in order for the knee joint to properly move. 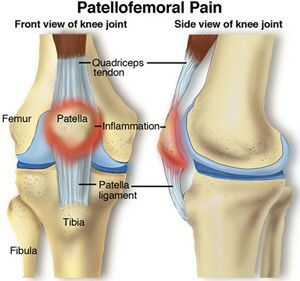 Patellofemoral Syndrome occurs when a muscle pulls the patella out of its proper pathway, causing inflammation, pain, and degeneration within the knee joint. You can have pain only in one knee or both. Decrease scar tissue build up and fascial adhesions. Increase mobility in tight joints such has ankle, foot, hip, knee. Many will say rest from the aggravating activity, this is so you don’t cause excessive damage to the involved tissue. Taking immediate attention with Massage Therapy and being disciplined with your home care exercises you can continue with your training and not fall off your plan. Coming in for a focused and therapeutic Massage Treatment at Core Elements, followed by the attention to the below exercises daily, can help set you on the right path to recovery. Facing the wall, standing about two feet away, place your hands against wall. Step forward with one foot and a bent knee. With both heels on the floor, lean your hips towards the wall while keeping the leg in the back straight to stretch the calf muscle. Hold for a count of 20. Repeat 3 times. Standing near something that can be used for support, reach back with one hand, grabbing your foot and ankle. Bend your knee and bring your heel up towards your buttocks. Contract your gluteal muscle at the same time to be sure your pelvis is in the right position for the best stretch. Hold for a count of 30. Repeat 3 times. Sitting on the edge of a bed or sturdy table with one leg off the edge, the other leg straightened on the bed or table, lean towards the straightened leg keeping your back straight. Hold for a count of 30. Repeat 3 times. Hip Adductor strengthening– This exercise can be performed seated or lying on your back with both with knees bent. Place a pillow towel roll or ball between your knees. Squeeze your knees together and hold for ten seconds. Repeat this exercise ten times. 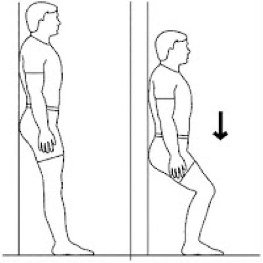 Quadriceps strengthening– Stand with your back against a wall, with your feet one and one-half to two feet from the wall. Slowly bend your knees and slide to a sitting position as far down as comfortable. Don’t allow your knees to move forward of your feet and or you hips to move lower than your knees. Hold for ten to twenty seconds and then return to standing. Repeat five times. If this is not comfortable try lying down on the ground and preform a straight leg lift. Raise your leg several inches off the ground and hold for 10 seconds then lower. Foam rolling of the quads and gluteal muscles is another exercise to help break down tissue adhesions that can also contribute to the problem. Book your massage online at www.orleanscoreelements.com or call us at 613-590-9339.